Carl Bernstein, the journalist famous for exposing details related to the Watergate scandal, was on MSNBC and described the United States Justice Department’s seizure of phone records of reporters as a “matter of policy” that went all the way up to the president. “The object of it is to try and intimidate people who talk to reporters, especially on national security matters. National security is always the false claim of administrations trying to hide information that people ought to know,” Bernstein added. It was May 2013, and Bernstein was reacting to the news that President Barack Obama’s Justice Department “secretly obtained two months of telephone records” of reporters and editors, who worked for the Associated Press, in order to help them prosecute a leak case against Donald Sachtleben, an FBI agent. Now President Donald Trump and his administration continue that policy of intimidation and contempt for freedom of the press. James Wolfe, a former Senate intelligence committee aide, was charged [PDF] and arrested for allegedly lying to FBI agents about his contacts with at least four journalists. He reportedly confirmed that Carter Page, a former Trump campaign adviser, was testifying before the committee. The New York Times reported that prosecutors “secretly seized years’ worth” of New York Times reporter Ali Watkins’ phone and email records. Apparently, the FBI was interested in how Watkins learned Russians allegedly tried to recruit Page. The Justice Department obtained “years of customer records and subscriber information” from companies, including Google and Verizon. The records included details from messages Watkins sent with her university email account when she was an undergraduate. They also targeted communications sent through “anonymizing message applications,” like Signal and WhatsApp. “Seizing a journalist’s records sends a terrible message to the public and should never be considered except as the last resort in a truly essential investigation,” stated Bruce Brown, executive director of the Reporters Committee for Freedom of the Press. Watkins had a relationship with Wolfe from 2014 to 2017. Wolfe worked as the security director for the committee from May 1987 to December 2017. In December, FBI agents presented Wolfe with an “investigative questionnaire” that contained questions asking for “yes” or “no” answers. One of the questions alerted Wolfe to the fact that this was part of a criminal investigation, informed him it was wrong to make false statements, and asked him about his interactions with reporters. Following completion of the questionnaire, FBI agents claim they directly asked Wolfe about a report Watkins published with information they allege was provided to the Senate intelligence committee. Wolfe allegedly said he did not know anything about Watkins’ sources. “After Wolfe stated that he did not know about [Watkins’] sources, FBI agents confronted Wolfe with pictures showing Wolfe together with [Watkins],” according to the indictment. While the indictment states unequivocally that Wolfe “lied” to agents, it does not quote Wolfe. Wolfe apparently insisted he never disclosed classified information to Watkins nor did he provide her with “news leads, intelligence, or information about non-public” committee matters. Allegedly, in October 2017, Wolfe contacted Reporter #4 using Signal and offered to “act as an anonymous source.” He urged the reporter to never use his name with his colleagues or any news media colleagues. In 2013, Associated Press CEO Gary Pruitt was outraged to learn the Justice Department had seized records from 20 separate telephone lines used by AP journalists in April and May of 2012. “These records potentially reveal communications with confidential sources across all of the news gathering activities undertaken by the AP during a two-month period, provide a road map to AP’s news gathering operations, and disclose information about AP’s activities and operations that the government has no conceivable right to know,” Pruitt declared. On first glance, this seems more targeted, but similarly, the seizure of records still undermines the First Amendment rights of journalists. It also was a way for the Trump administration to collect intelligence on reporting about how it was handling Special Counsel Robert Mueller’s investigation so they could protect the administration from scrutiny. Days after news broke about the seizure of AP’s phone records, it was revealed the Justice Department labeled Fox News reporter James Rosen an “aider, abettor, and co-conspirator” in a leak by State Department employee Stephen Kim—effectively criminalizing journalism. The backlash from U.S. news organizations led Attorney General Eric Holder to issue a set of new policies that supposedly tightened procedures for investigations that involved journalists. Holder indicated support for a media shield law to protect reporters, but one never passed and the guidelines are not law. They can be flouted or ignored by the Trump administration. Moreover, Holder and the Obama administration did lasting damage to reporters’ freedom by continuing to pursue a subpoena against New York Times reporter James Risen to force him to testify against his source, CIA whistleblower Jeffrey Sterling, who was accused of a leak. It resulted in a decision in November 2013 from the U.S. Circuit Court of Appeals for the Fourth Circuit that no “reporter’s privilege” in criminal cases existed. Reporters like Risen should be required to testify about their confidential sources. Despite the overtures to reporters in the summer, the Obama administration had no problem with this decision. They were only for protecting reporter’s freedoms when it did not infringe upon their unfettered ability to pursue prosecutions. When Obama engaged in this conduct, there was bipartisan support. Democratic Rep. Chris Van Hollen defended the administration when he was on MSNBC, saying the White House had a responsibility to make sure information was not leaked that would put lives at risk. Former senior adviser to Obama, David Axelrod, initially said Holder should not apologize for the aggressive surveillance of Rosen. This is the third case from the Justice Department to target journalists’ sources. Others include NSA contractor Reality Winner, who allegedly released an NSA report on Russian hacking during the 2016 presidential election, and FBI agent Terry Albury, who pled guilty to disclosing information related to how the FBI pressures immigrants into becoming informants. Few U.S. senators or representatives will condemn the actions of the Trump administration because they support giving law enforcement and prosecutors wide latitude to target government personnel for leaks and find the value of “protecting” the so-called sanctity of classified information outweighs any collateral impact on press freedom. The work of the Obama administration and the bipartisan consensus in Washington empowers the Trump administration to ramp up efforts to control the flow of information to media organizations through threats of prosecution. 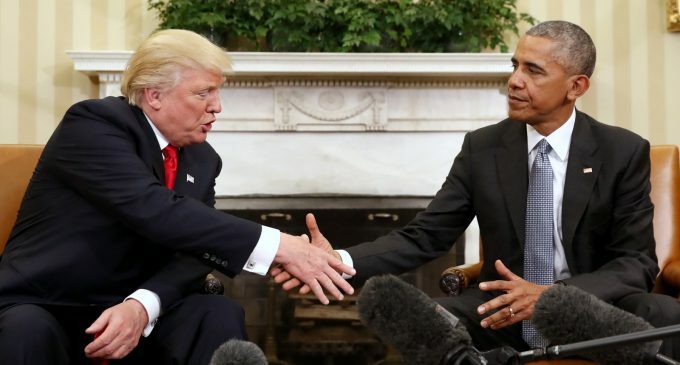 President Trump and Attorney General Jeff Sessions may be more zealous in their tone than Obama and Holder, but they are virtually picking up where the Obama administration left off in its war on leaks. That war and its attacks on freedom of the press were viewed by several journalists as the worst since President Richard Nixon’s administration. The recent leak case against Wolfe confirms the climate for the press is only going to get worse. The post Picking Up Where Obama Left Off: Trump’s Justice Department Seizes Reporters’ Records appeared first on MintPress News.